Painters tape can help with any interior painting project. Painting is a process. If you are going to try your hand at interior painting, you need to realize that it always requires a fair amount of preparation. In addition to moving furniture, laying out drop cloths, and buying your painting supplies, you will also need to break out the painter’s tape! If you want to achieve the best results possible, you can skip on taping up certain areas. If applied well, painters tape can provide you with clean, straight lines. 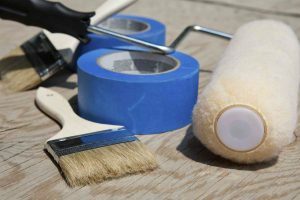 Read on for some of the best practices for using painters tape. Before you go to apply tape to your baseboards or trim, it is in your best interest to spend some time cleaning them. This is because the sticky side of the tape won’t adhere to the surface if there is dirt or dust on it. All you need to do is grab a damp cloth and give them a quick wipe down. This should only take you a few minutes. Professional painters frequently use kraft paper. If you are going to use kraft paper as a means to protect your floors, you need to ensure it is going to move while you are painting. All you need to do is tape the paper to the baseboards using painters tape. The combination of painters tape and kraft paper are one of the best for preventing drips from hitting your floor. If you don’t want to use kraft paper, you can opt for painters plastic instead. After you have applied your painter’s tape, you need to ensure that it adheres to the surface. Use your fingers or a putty knife to ensure the tape has a strong bond. If the tape is not applied well, there is no guarantee that the paint will not get through to the surface.